i love today's Gospel reading (John 15:9-11) - it is the reading that marks the back of my priestly ordination card, three years ago now. it was also the Gospel that was proclaimed on this very important day. the last verse - "I have said these things to you so that my joy may be in you, and that your joy may be complete." 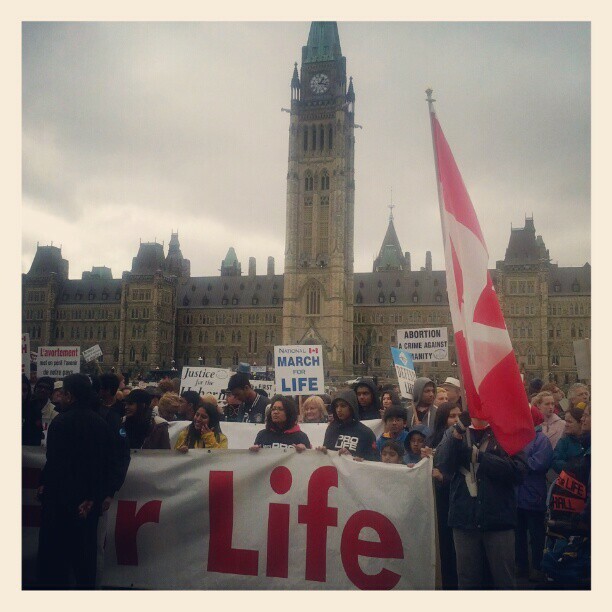 - is what we did today, ... march for life! marching for life gave me great joy today! as i mentioned earlier on twitter, the day began with mass at the Cathedral, presided by His Grace, Archbishop Prendergast, and his young MC, me. i just didn't stand there, i bust[ed] a move - half a dozen bishops, almost 50 priests, and a Cathedral that was busting at the seams - i'd say 1500 people (1, 2) - celebrated the central mystery of our faith, and then joined the almost 20000 on Parliament Hill to begin the March For Life, and to open the conversation! let's keep this joy going! don't forget about the Diocesan Feast Day, June 7th @ 1930, and of course, the next International Eucharistic Congress, in Dublin! bust a move! Congress countdown: 4 WEEKS 3 DAYS 3 HOURS 18 MINUTES 43 SECONDS. Our group, accompanied by His Grace, totals 26 pilgrims! Currently, there are 940 Canadians registered, among the almost 15,000 registered for the week! There will be Canadian activities taking place at the hotel where the Ottawa pilgrims are staying. Please continue to pray for the success of the next International Eucharistic Congress. Please visit the weekly program. 1, 2, 3, on y va: COMPTE À REBOURS AU CONGRÈS: 4 SEMAINES 3 JOURS 3 HEURES 18 MINUTE 43 SECONDES! Nous sommes presque là! Nous sommes 26 pèlerins, accompagnés par notre Archevêque! En ce moment, il y a 940 canadiens parmi les presque 15000 pèlerins. Il y a des activités spéciales de prévues pour les Canadiens. Svp continuez de prier pour le succès du Congrès Eucharistique Internationale! Le programme de la semaine.